Aim: To assess the extent and severity of coronary artery disease (CAD) in 200 consecutive patients aged 35 years or less undergoing diagnostic coronary angiography. Patients and Methods: Findings in these 200 patients (≤ 35 years of age) were analyzed to find the extent and severity of CAD. The mean age was 31.69 (±3.76) years. Majority were males (94%) and from the Arab ethnicity (70.5%). Result: Smoking (71%) and history of premature CAD (27%) were the most frequent risk factors (RF). History of previous ST elevation myocardial infarction (MI) was present in 68%. Anterior wall MI was the most frequent location (63.3%). The majority (54.3%) had moderate or large size MI. Ejection fraction (EF) less than 50% was noted in 30.3%. Left main or triple vessel CAD was seen in 15%. One- and two-vessel CAD was seen in 32.5% and 19% patients, respectively. Coronary angiogram was completely normal in 23.5%. The majority (54.5%) were treated conservatively and the rest (45.5%) needed percutaneous coronary intervention (PCI) or coronary artery bypass graft (CABG). The mean number of stents used was 1.3 ± 0.67 and the mean length of stents used was 20.3 ± 12.6 mm. Conclusion: The extent and severity of CAD was very significant in this subgroup of very young (≤35 years) Asian patients. Smoking was the main risk factor and half of the patients needed either PCI or CABG. It is also known that the long-term prognosis and functional status of young patients who have acute myocardial infarction (MI) is not benign. Though percutaneous coronary intervention has been done successfully in young patients with very promising short-term results; , in the long term there was need for repeat revascularization in a significant proportion of patients. Encouraging results have been reported in young patients undergoing CABG. ,,, Lytle et al. from the Cleveland Clinic have reported excellent 5-year survival in 107 patients ≤35 years undergoing CABG. Similar encouraging results were reported by Fitzgibbon et al. in 138 men ≤39 years old. If we want to understand the complexities of manifest CAD in the young, we need to study patients from different population subgroups in detail. Though there are studies on CAD in the young, overall there is a paucity of detailed studies from various geographical and ethnical subgroups. Also angiographic studies are very few and do not analyze the details of angiographic morphology. Therefore, we analyzed the ethinicity, extent and severity of CAD in the very young in patients undergoing diagnostic coronary angiography in our hospital. Two hundred consecutive patients aged ≤35 years undergoing diagnostic coronary angiography (CAG) were enrolled in the study. Relevant historical details were gathered and entered in a specially prepared questionnaire. Height and weight were measured and the body mass index (BMI) expressed as kg/m 2 was calculated. BMI more than 25 and ≤30 was considered overweight and >30 as obesity. Overnight fasting samples were obtained for the blood tests. Diagnsotic CAG was performed from the right femoral artery using the standard percutaneous techniques. Selective left and right coronary angiograms were performed in multiple angulated views. In most cases left ventricle (LV) was entered and the left ventricular end diastolic pressure (LVEDP) was measured. LV angiography was done in the right anterior oblique projection. LV ejection fraction (EF), extent of myocardial wall motion abnormality (to assess the size of the MI), and the severity of mitral regurgitation (MR) if any were noted. Detailed analysis of the angiographic images was done by two experienced interventional cardiologists. With regard to the coronary arteries attention was paid to the presence of any luminal narrowing and to the number of coronary vessels and segments involved. Morphology of the lesions and other angiographic abnormalities were also documented. Eye-balling method was used to estimate the percentage and length of the lesions. Depending on the degree and extent of regional wall motion abnormality, MI size was estimated as small, medium, or large. We evaluated the following coronary artery segments separately to assess the extent and severity of disease. Left main coronary artery, proximal, mid and distal left anterior descending (LAD) artery segments, major diagonal branches, proximal, mid and distal circumflex artery segments, major obtuse marginal branches (in addition Ramus Intermedius branch if present), proximal, mid and distal right coronary artery (RCA) segments, posterior descending artery (PDA), and posterolateral (PL) segments. Data was entered and analyzed using SPSS version 13. Out of 6918 patients catheterized during a 36-month period, there were 200 patients ≤35 years of age. Their mean age was 31.69 (± 3.76) years with a range of 19-35 years. There were 188 males (94%) and 12 females (6%). The major proportion (68.9%) of the patients was Arabs and the rest was mostly from the Indian subcontinent. Risk factor profile was fully evaluated [Table 1]. As expected, smoking was the most common risk factor seen in 71% (142/200). Obesity (BMI more than 30 kg/m 2 ) was seen in 20% and overweight (BMI more than 25 kg/m 2 ) in 39%. Family history of CAD was obtained in 27% of patients, whereas hypertension and diabetes mellitus were seen only in 19.5% and 17%, respectively. Mean serum LDL cholesterol was 3.27 mmol/L (±0.14) with 36.5% having values >3.4 mmol/L and 70% having values >2.5 mmol/L. 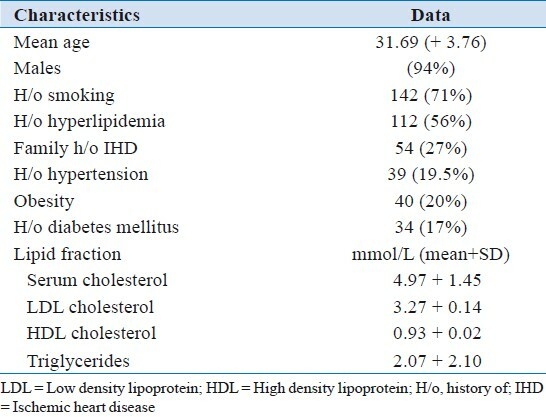 Serum total cholesterol >4.9 mmol/L was seen in 42.7%. Most of the patients (72.5%) were referred for CAG after acute coronary syndrome. History of prior MI was obtained in 68% [Table 2]. In the 136 patients with history of MI, involvement of the anterior wall was the most common and was seen in 63.3% [Table 3]. Clinical evidence of heart failure was seen in 5.6%. Mean LVEDP was 17.72 mmHg. LV end-diastolic and end-systolic volumes were mildly increased. LVEF was <50% in 30.3% patients. MR was seen in 10.5% and was mild in most the cases. The majority of patients (54.3%) were found to have moderate or large size MI (as estimated from LV angiogram) [Table 4]. 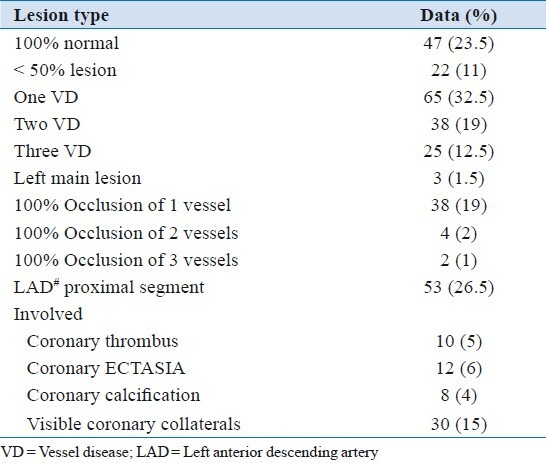 Coronary angiographic features are shown in [Table 3]. Significant CAD was seen in a high percentage (65%) with the majority (32.5%) having single-vessel CAD. Most patients with significant CAD had either one or two segments involved. However a good number of patients had more segments involved, with eight segments being the most extensive. Similarly distal vessel coronary artery disease was not uncommon, being documented in 33 patients. In those with involvement of multiple segments (three to eight segments), complex lesion anatomy was seen in 12 patients. Total occlusion of significant size vessel was seen in 44 patients. Total 26.5% of patients had proximal LAD segment involved. About half of the patients needed revascularization with PCI (32%) or CABG (13.5%) [Table 5]. In patients undergoing PCI, the mean number of stents used was 1.3±0.67. The mean length of stents used was 20.3±12.6 mm and the mean diameter of the stents was 3.03±0.25mm. In patients undergoing CABG the mean number of grafts was 2.57±1.29 (range 1-5). And 47.6% needed three or more grafts and in 23.8% four or five grafts were used. In agreement with earlier studies, we found a history of smoking to be the most important risk factor in 71% of the patients. Similarly family history of CAD was present in a high percentage of patients. A complex interplay of genetic and environmental factors in the presence of smoking is the most likely reason for the early manifestation of CAD in these patients. Not much literature is available with respect to angiographic features in very young patients undergoing CAG, and when available they represent only a very small percentage of total population of young patients with CAD. Wolfe et al. from the USA analyzed angiographic features in 35 patients who were <35 years of age (1.5% of the total number catheterized). They were compared with 100 patients ≥55 years of age. They found a very low prevalence of triple-vessel CAD in the first group (14.3%) as compared to 43% in the second group. In the study by Glover et al.,  120 consecutive patients 35 years or younger underwent coronary angiography following a clinical MI. Significant CAD was seen in 78% and the prevalence of triple-vessel CAD was 42%. In an earlier article published from our center, we had studied 60 patients less than 35 years of age following a first MI. Significant CAD was present in 73.3%. However triple-vessel CAD was seen only in 5%. In 25% there was involvement of more or equal to three coronary artery segments. Chen et al. from the United Kingdom analyzed the findings in 100 male patients with the clinical onset of disease at age ≤45 years. These were compared with the findings in 100 older male patients ≥60 years. Younger patients were found to have angiographically complex stenosis morphological features (59% vs 36%; p<0.01). At the same time, they had less extensive CAD (one vessel CAD in 54% vs 36%; p< 0.001). Triple-vessel disease was present in only 10% of the young patients. LVEF <50% was seen in above a third of our patients. LV dysfunction in this young age would definitely affect the long-term prognosis. When compared to our earlier study on very young patients  and published in 1999, the percentage of triple-vessel disease has increased from 5% to 12.5% and that of single-vessel disease has decreased from 46.7% to 32.3%. In the present study involvement of ≥4 segments was seen in 20.8% patients as compared to only 11.4 % in our earlier study. Whether these differences represent a more aggressive disease in the later years is not clear. We have studied very young Asians from the Arab and Indian subcontinent backgrounds. Cut-off age of ≤35 years years represents very young patients. We used the number of diseased vessels involved (one-, two-, three vessel or left main) to assess the severity of CAD. We have done more detailed analysis of the angiographic features. We have not done a detailed analysis of the various lipoprotein subfractions. Analysis of the lipoprotein subfractions including Lp(a) would throw more light on the pathogenesis of premature CAD in our patients. We also could not do any genetic studies. As in many other studies we have used eye-balling to grade angiographic stenosis. It could be argued that a more objective quantitative analysis would yield more accurate results. We live in an age where there is a global rise in the prevalence of manifest CAD. This is occurring even in developing countries and is affecting a significant number of people at a younger age. There is an urgent need to study this subject at greater depth and come out with adequate preventive and therapeutic measures before it is too late. We appreciate the technical help we received from our Cardiac Catheterization laboratory staff, both radiology technicians and nursing staff. Also we acknowledge the secretarial help from Shahid Khan and his colleagues. 1. Fournier JA, Sanches A, Quero J, Perez Cortacero JA, Gonzales BA. Myocardial infarction in men aged 40 years or less: prospective clinical - angiographic study. Clin Cardiol 1996;19:631-6. 2. Cole JH, Sperling LS. Premature Coronary artery disease: Clinical risk factors and prognosis. Curr Atheroscler Rep 2004;6:121-5. 3. Imazio M, Bobbio M, Bergerone S, Barlera S, Maggioni AP. Clinical and epidemiological characteristics of juvenile myocardial infarction in Italy: The GISSI experience. G Ital Cardiol 1998;28:505-12. 4. Wolfe AM, Vacek JL. Myocardial Infarction in the young. Chest 1988;94:926-30. 5. Doughty M, Mehta R, Bruckman D, Das S, Karavite D, Tsai T, et al. Acute myocardial infarction in the young - The University of Michigan experience. Am Heart J 2002;143:56-62. 6. Woon VC, Lim KH. Acute myocardial infarction in the elderly - the differences compared with the young. Singapore Med J 2003;44:414-8. 7. Jalowiel DA, Hill JA. Myocardial infarction in the young and in women. Cardiovasc Clin 1989;20:197-206. 9. Choudhury L, Marsh JD. Myocardial Infarction in Young Patients. Am J Med 1999;107:254-61. 10. Vardan S, Mookherjee S, Vardan S, Sinha AK. Special Features of coronary heart disease in people of the Indian sub-continent. Indian Heart J 1995;47:399-407. 11. Chen L, Chester M, Kaski JC. Clinical factors and angiographic features associated with premature coronary artery disease. Chest 195;18:364-69. 12. Mocetti T, Malacrida R, Pasotti E, Sessa F, Genoni M, Bariera S, et al. Epidemiologic variables and outcomes in 1972 young patiens with acute myocardial infarction: Data from GISSI 2 data base. Arch Intern Med 1997;157:865-9. 13. Gotsman I, Lotan C, Mosseri M. Clinical manifestations and outcome of acute myocardial infarction in very young patients. Isr Med Assoc J 2003;5:633-6. 14. Klein LW, Agarwal JB, Herlich MB. Prognosis of symptomatic coronary artery disease in young adults aged 40 years or less. Am J Cardiol 1987;60:1267-72. 15. Cole JH, Miller JI, Sperling LS, Weintraub WS. Long term follow up of coronary artery disease presenting in young adults. J Am Coll Cardiol 2003;41:521-8. 16. Glover MU, Kuber MT, Warren SE, Vieweg WV. Myocardial infarction before age 36: Risk factor and arteriographic analysis. Am J Cardiol 1982;49:1600-3. 17. Tewari S, Kumar S, Kapoor A, Singh U, Agarwal A, Bharti BB, et al. Premature coronary artery disease in North India: an angiography study of 1971 patients. Indian Heart J 2005;57:311-8. 18. Fournier JA, Cabezon S, Cavuela A, Ballesteros SM, Cortacero JA, Diaz dela LL. Long term prognosis of patients having acute myocardial infarction when ≤ 40 years of age. Am J Cardiol 2004;94:989-92. 19. Stone GW, Ligon RW, Rutherford BD, McConahay DR, Hartzler GO. Short term outcome and long term follow up following coronary angioplasty in the young patient, An 8-year experience. Am Heart J 1989;118:873-7. 20. Kofflard M, de Jaegere P, Van Domburg R, Ruygrok P, Van den Brand, Serruys PW, et al. Immediate and long term clinical outcome of coronary angioplasty in patient aged 35 years or less. Br Heart J 1995;73:82-6. 21. Lytle BW, Kramer JR, Golding LR, Cosgrove DM, Borsch JA, Goormastic M, et al. Young adults with coronary atherolsclerosis: 10 year result of surgical myocardial revascularization. J Am Coll Cardiol 1984;4:445-53. 22. Fitz Gibbon GM, Hamilton MG, Leach AJ, Kafka HP, Markle HV, Keon WJ. Coronary artery disease and coronary bypass grafting in young men: Experience with 138 subjects 39 years of age and younger. J Am Coll Cardiol 1987;9:977-88. 23. Cohen DJ, Basamania C, Graeber GM, Deshong JL, Burge JR. Coronary artery bypasses grafting in young patients under 36 years of age. Chest 1986;89:811-6. 24. Ng WK, Vedder M, Whitlock RM, Milsom FP, Nisbet HD, Smith WM, et al. Coronary revascularization in young adults. Eur J Cardiothoracic Surg 1997;11:732-8. 25. Wei JY, Bulkley BH. Myocardial infarction before age 36 years in women: Predominance of apparent non atherosclerotic events. Am Heart J 1982;104:561-6. 26. Culic V, Miric D, Jukic I. Acute myocardial infarction: Differing preinfarction and clinical features according to infarct size and gender. Int J Cardiol 2003;90:189-96. 27. Hayat N, Mohammed M, Simo M. Coronary Artery Disease in Patients aged 30 and younger. Jap Heart J 1986;27:679-84.